We recently published a list of the Best Suburbs in America, factoring in public school ratings, housing affordability, proximity to nearest metropolitan area, and median household income, among other values. Turns out, some of these suburbanites make bank. For this list, we ranked the best suburbs in America by median household income, provided by the U.S. Census Bureau’s 2008-2012 American Community Survey Estimates. We only considered suburbs within 40 kilometers (25 miles) of the nearest metropolitan area — which explains why some wealthy suburbs (such as the relatively isolated Greenwich, Connecticut, or Great Neck, New York) didn’t make the cut. 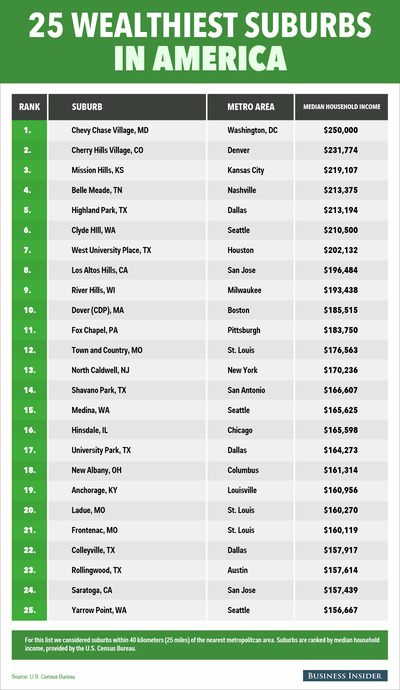 The top 25 suburbs span coast to coast, with Saint Louis and Dallas landing three of its suburbs on the list. The top-earning small town is Chevy Chase, Maryland, located a half hour outside Washington, D.C., where residents make a median household income of $US250,000.